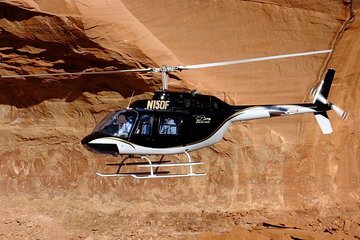 Explore Sedona’s iconic red rock formations on a 35-minute helicopter tour, and enjoy aerial views of the cliffs and ridges that define the Sonoran Desert landscape. Soar above Cathedral Rock and Bell Rock, then steer past the imposing Three Nuns; take in Snoopy Rock and Steamboat Rock, and watch for the javelinas, elk and deer that thrive in the wild desert terrain. As you bank back towards Sedona, get a glimpse of Secret Canyon and see the cliff-side dwellings of the Sinaguan people, built high into an inaccessible cliff. Don't forget your camera for endless photo opportunities! The helicopter just passed the attraction and then hovered so it was impossible for me to take photos. Treated well by everyone. The absolute best way to see this area! This was at the very top of my bucket list, my husband, not so much but he loved it. It was a great 75th birthday present and we were totally thrilled. The ride was exactly what I was told it would be. The presentation on the computer was well done. Fantastic job! Amazing!!! Our pilot made this our best adventure in Sedona. The pilot and tour were great, however, we were not made aware of the fact that the helocopter had no doors on it until we arrived for the flight. It would have been helpful to know that when we booked. My wife was very uncomfortable the entire flight and would not have gone had we known. We had a wonderful experience. John welcomed us at the airport (he has terrific customer service skills) and Bill the pilot provided a trip to remember. If you are in Sedona see it through the air. It is worth the money.